Fall is a beautiful time of the year, isn’t it? Not only do we seem to appreciate the lovely colors of the changing season and the beautiful smells around us, but there seems to be a need for change. We tend to slow down because the busyness of the summer has past. The weather has changed and the need to stay indoors and enjoy the comforts of home is demanding. It is also a time to change our home and living spaces to suit the weather conditions. 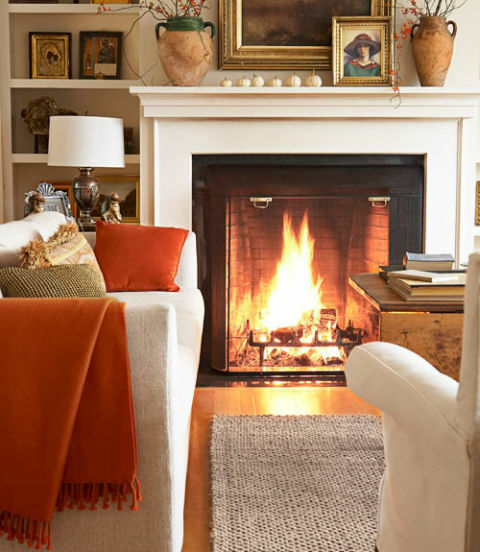 Here are 6 Ways (with choices) to Bring Some Fall Cozy Into Your Homes, in no particular order. Note: While the title says “6 ways”, notice that most of them come with a variety of ideas and options. 1. Add Fall Colors: Fall itself comes with so many beautiful colors. Why not bring some color indoors? It does not have to be expensive. 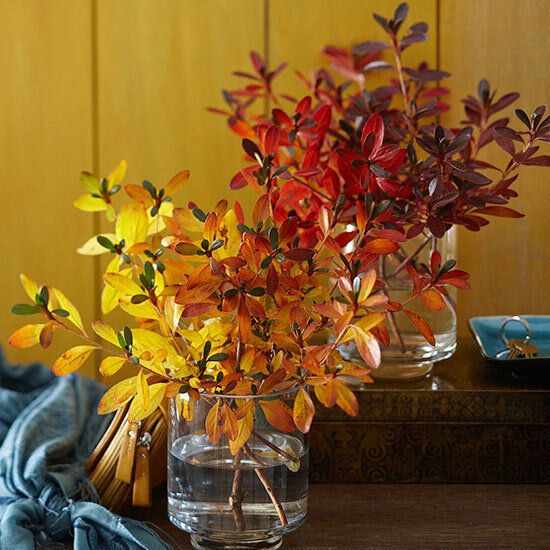 Gather leaves and bushes from outside and create beautiful centerpieces. 2. Use real pumpkins from your garden or purchase a few inexpensive ones from a grocery. You can even use fake ones from the Dollar store, too. If you prefer earth tones, then go for it – it is just as beautiful! 2. Add Warmth: Warmth comes in many forms. But here are some ways to add some warmth to your Autumn home. Use cozy blankets and throws. Gather up those soft cozy blankets and throws you stored away during the summer and place them on couches or store them in baskets in the living and family rooms. Make them ready and available for your family on those cozy Fall days and nights when all you want to do is snuggle up on the couch with a cup of hot coffee, a good book, or a movie. Add Cozier Bedding, Linens, and Window Curtains: Use curtains to warm up the space. 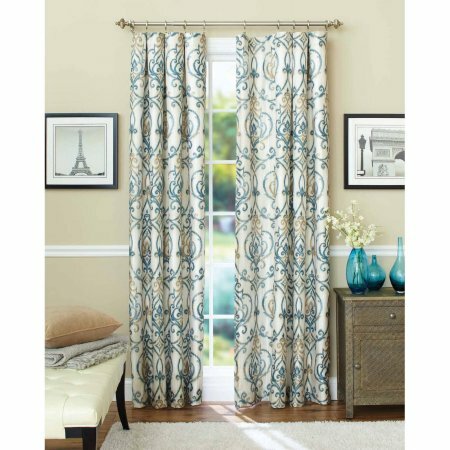 Heavier window curtains and panels are more suitable for the colder season. But lighter curtains will definitely let more light into the home which is something I love. Choose bedding that will keep you warm. Personally, I like using quilts and flannels for this time of the year. Down and Down-alternative bedding are great for this time, too. They will keep you nice and snugly! Fireplace: If you own a fireplace try lighting it up every once in a while. It will warm up your home in many ways. 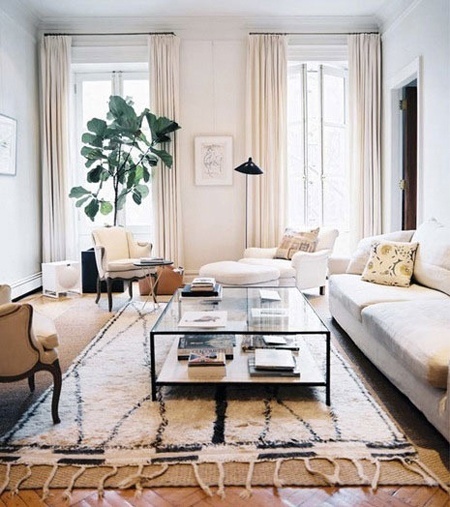 Not only will your home be warm from the heat but it will bring a sense of that cozy warmness as it glows in the home. Make sure it is working and safe to light up for your family to enjoy when the weather drops. Bring on the cozy warming drinks! 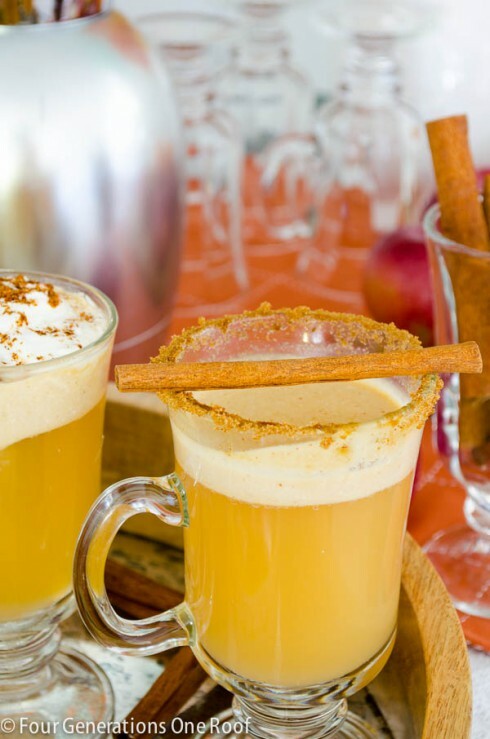 Hot chocolate, cider, mocha, hot tea or any of your favorite Fall drinks. Throw pillows: There is something great about throw pillows. They definitely will make or break how your space looks. 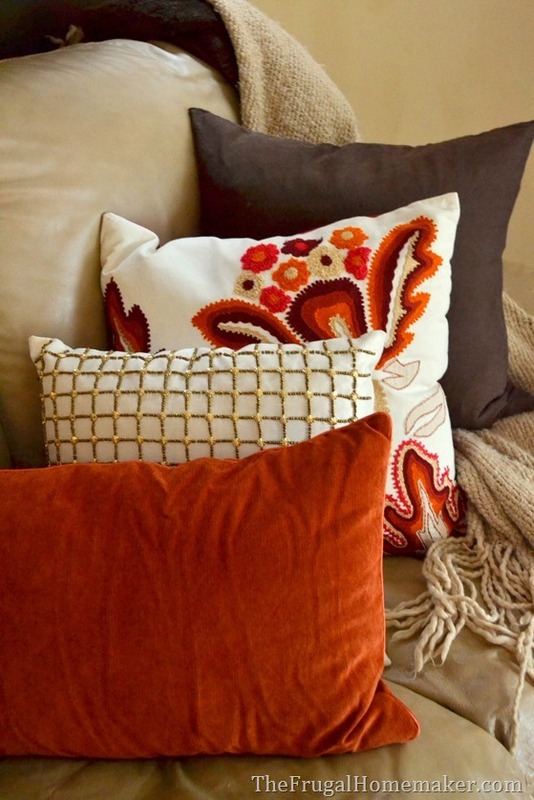 Adding some seasonal throw pillows to go along with those cozy blankets will make your home feel welcoming, warm, and inviting. Candles: Nothing like a soft glowing candle to depict the mood of a home! They will add a sense of welcome and warmth to the home. Using Fall scented candles (cinnamon, caramel, pumpkin pie spice, etc) not only will add a feel of warmth and welcome to your home but it will make your home smell wonderful, too! Layered accent rugs & door mats will add more texture to your home. They will immediately change the look and feel of your home. If you have hardwood floors, adding some accent rugs will keep your feet warm, too. But accent rugs can be pricey. If you cannot afford to invest in one at the moment, then maybe a simple door mat change up for the season will do. You definitely want your door mats to hold up to weather changes. Woven baskets to hold blankets (as mentioned earlier) are great for adding texture. 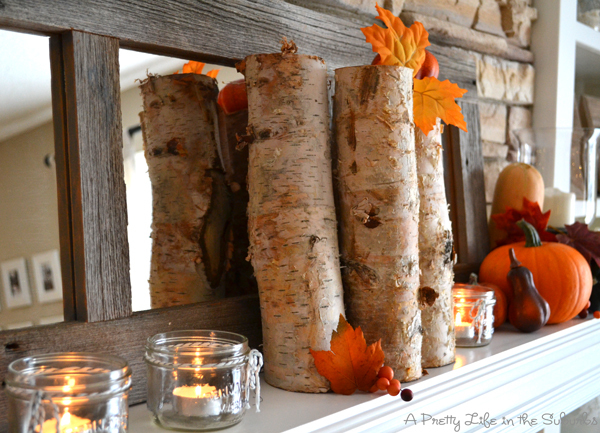 Elements of nature like pieces of wood are great for adding some Fall texture to your home. 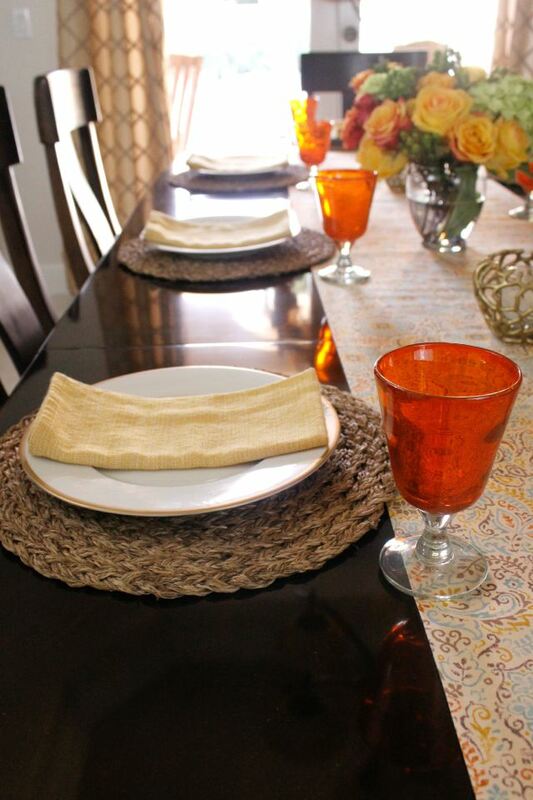 Add touches of Fall to your dinning table for a simple change. You could use your regular dishes and add specks of Fall tones or a few colored napkins. Do a Potpourri Fall Boil using your Favorite Autumn scents. A mixture of cinnamon, oranges, nutmeg, and cranberries will make your home smell amazing! Bake Something Special: One could never over all the tasty Autumn recipes that the universe has to offer! The possibilities are endless. 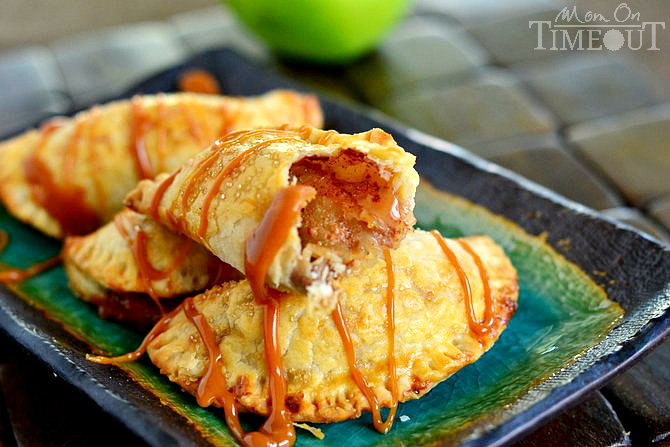 Baking something special with pumpkins, apples or caramels, will create a beautiful aroma throughout the home. Remember, it does not have to be pricey or complicated to be beautiful. Use what you have on hand first before purchasing. And if you must purchase, then try to invest in quality stuff (that you actually love) that you can use over and over again (Note to self here, too)! 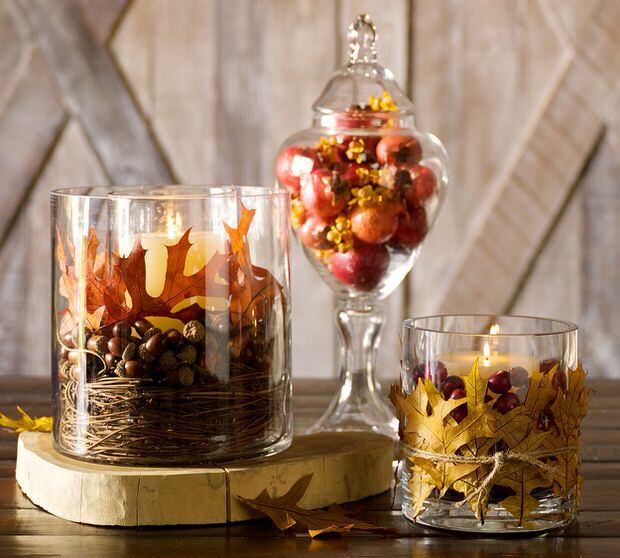 How do you bring Fall into your homes? I would love to know in the comments! I bet you can’t wait! It is such a great joy to be able to decorate your own space! I love the colors of fall and I like to go outside and grab a large bunch of fall leaves and use them in centerpieces. All of these are great ways to add a touch of warmth to your fall decor. Nature is one of our best source when decorating for Fall, isn’t it! I love all the beautiful colors! I agree, it is such a beautiful time of the year! Thank you for featuring my fall table! I love all the other ideas as well! You are most welcome, Maria! It really is gorgeous!! It is a lovely time indeed. Hope you find some inspiration from these tips! I love the colors of fall! 🙂 These photos are just gorgeous! Thanks for sharing this, Zan! I know, the photos are really beautiful. I wish they were mine!! Love these ideas! 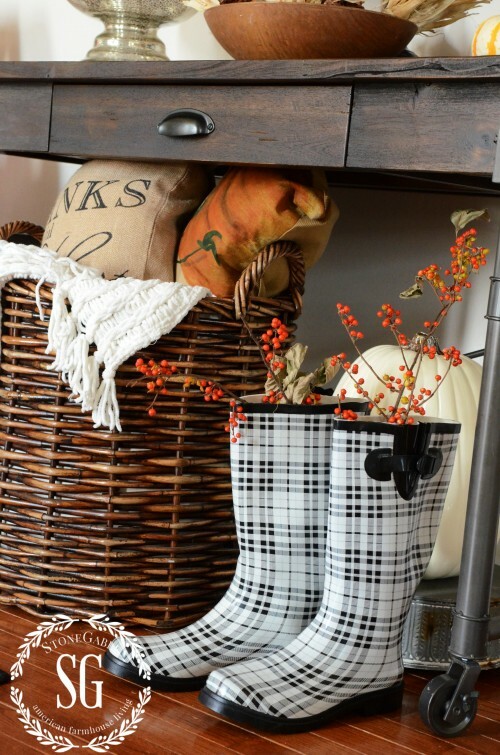 Super cute, I cant wait to use this list to finish up my house for the fall! So glad I could help Bianca. Hope your home turns out wonderful! Love this!!! So many ideas and tips for this fall. Thanks for sharing! I loveee all of these suggestions! Especially, bringing out cozy blankets, setting a fall table scape, and bring the outside in. I can’t wait to set up my fall entrance way with hay bales and such, it’s one of my favorite traditions! Doesn’t it make you want to decorate for real? What would we do without cozy blankets?! And hay bales are so great for decorating an entrance! I love your home! It looks so beautiful and cozy! 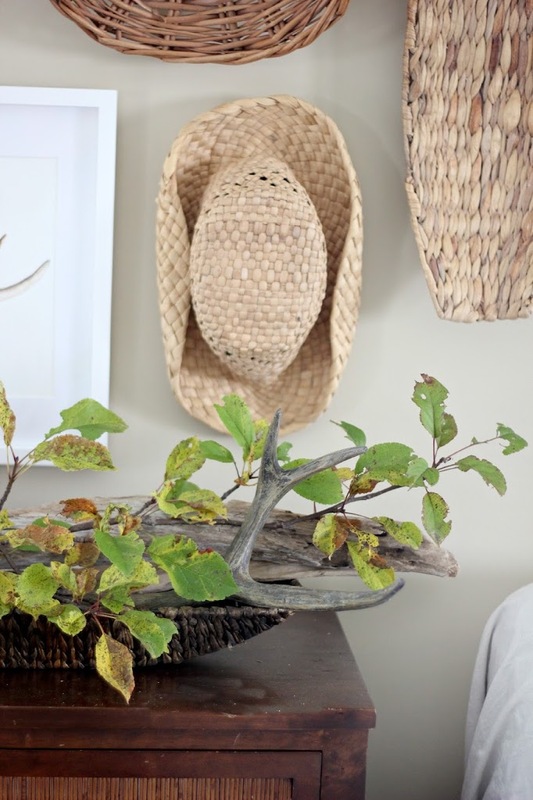 Fall itself is all about nature, so bringing items from nature into our homes is a great way to depict it! Thanks Jennifer. Cozy blankets and hot cocoa are some of my favs! Yes! I’m all about the cozy throws! I just got all mine out for the sofa and chairs <3 and i love adding natural fall leaves around for a bit of outside touch. One cannot go wrong with the natural look! Fall is beautiful!! Great ideas, Zan! I love those glasses-with-leaves centerpieces! So simple and elegant! And I’ve been baking quite a few Fall things already – I’m with you, it makes the house smell AMAZING!!! I’ve seen your some of your cooking recipes. They look delish! Zan, thanks for beginning with Scripture. Fall is lovely! Great choices you gave us.